Its hard not to notice an inch long wasp, let alone 5 or 6 flitting from flower to flower around you in the garden. 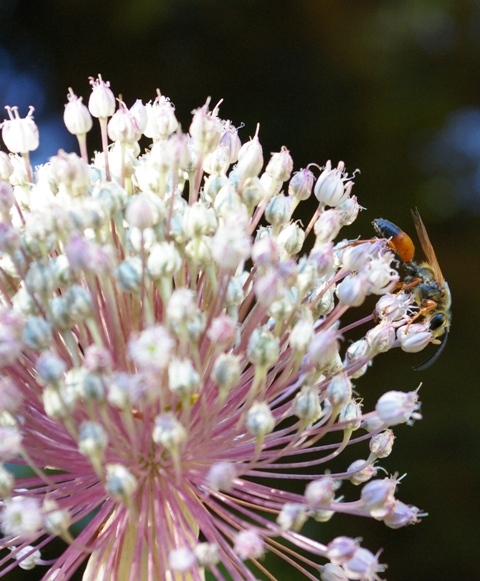 Last week while weeding I was mesmerized by the imposing wasps clambering over the allium flower spheres. Each made its way around, poking its head into the open flowers, twitching its wings and hanging upside down when needed. I was curious about the identity and activities of these creatures who took no heed to my investigation. I took some videos, moving my phone and later my camera within inches of them. At times one would jet to another flower if I cast a shadow across it, but they were completely docile. A little research in my entomology books and online revealed my busy garden friends to be Great Golden Digger Wasps (Sphex ichneumoneus) from the family of Sphecid wasps. 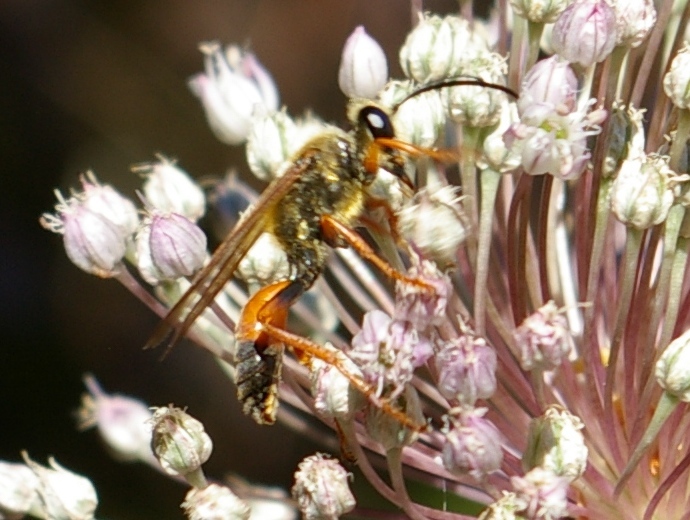 With orange legs and wings, and an abdomen that is half orange tipped in black, the wasp is mostly sleek, except for the flaxen hairs on it’s black head and thorax. The antennae are black. Like most solitary wasps, meaning those that nest individually, they are not aggressive (no hive to protect) and are seen only in summer when the adults eat nectar, which explains their attraction to the flowers. They are found from southern Canada throughout the US. As the name suggests, the Great Golden Digger female excavates holes in sunny, open and sandy areas where she creates underground burrows where her larvae develop. She forages for grasshoppers and crickets to feed her young, a great service to us gardeners. Great Golden Digger wasps are predatory insects that paralyze what they catch with a toxic sting before dragging it into its tunnels. After provisioning the burrows with the still living but motionless prey, the wasp will lay a single egg on the hapless grasshopper and cover the burrow. There are some amazing videos of Sphecid wasps actually moving pebbles to deftly cover the entrance holes. The eggs hatch in about 3 days and immediately begin voraciously feeding on the still paralyzed insect. Yikes! The following year, the larvae will have developed into an adult wasp and the lifecycle begins again when it flies from the tunnel to mate. Adults only live a couple months, during which time we might be lucky enough to see them and marvel at their interesting characteristics and appreciate their contribution to disposing of garden pests in the family of Orthoptera, which includes grasshoppers and katydids. After I saw them in my own garden, others around our area have mentioned noticing them, too. Apparently they can sting if manhandled, so don’t catch them–just let them do their thing, bizarre though it may be. Watching them dance around a flower as they dine on nectar is a lazy summer diversion and a cool reminder of the diversity of nature. In addition, there are some fascinating videos online of this engaging wasp as it creates its burrows. In my opinion, insects are some of the planet’s most amazing and entertaining creatures, especially when you start learning about the habits of the predatory insects! This entry was posted in Call me Segmented: Arthropoda & Insecta and tagged Beneficial Insects, great golden digger wasp, solitary wasps, Sphex ichneumoneus. Bookmark the permalink.